With citrus in season, last week's bottle of crème de cassis on the shelf and the flu sweeping the nation, there's never been a better time to add a little Vitamin C to your Sunday brunch! Pour crème de cassis in a flute, then add blood orange juice and stir. Top with Champagne. Notes: As usual, I'd recommend investing in a good bottle of cassis and a budget-friendly sparkler; you're mixing it with orange juice, after all! Whether you're sipping on this tart tipple tonight or with brunch on Sunday, I hope you'll enjoy it–cheers! Photograph by Noel Barnhurst, recipe by Amelia Saltsman for Bon Appétit. Yum! 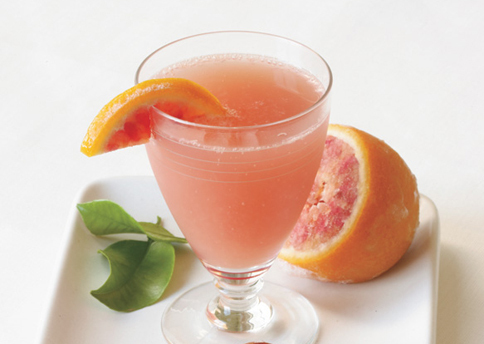 I love blood oranges.. And cocktails that make me feel healthy. :) happy weekend! Here's a toast to boosting our immune systems with delicious drinks! i know what i'm having for happy hour tonight! Oh that looks sooo amazing... can I start happy hour early? ... please? This kind of drink is right up my alley :) Have a wonderful weekend, Lena! Next time I'm in SF, we HAVE to go for a drink. I just know you'll rock my world! I LOVE blood orange juice. I have yet to try creme de cassis so I'll be adding this to my 'To Do' list!